While Valentines Day is usually a celebration of romantic love, don’t forget to celebrate your love for your children during this special time. There are many simple ways to make Valentines Day fun for your children, and to remind them that they are special to you. -Make a fun Valentines version of Eggs in a Nest. Use a medium sized heart cookie cutter and cut a heart shaped hole in the center of a piece of bread. Oil or butter a frying pan over medium heat. Place the bread on the frying pan and crack an egg in the center. Flip with a spatula when the egg looks to be decently done. Continue to cook until the egg is mostly cooked through. Longer if you want you yolk all the way cooked or shorter for a runny yolk. -Paper plates for each guest. They can use them while decorating their cookies and for taking their cookies home with them when they leave. -Hit the Dollar Store or Dollar Section: There’s no question that kids love to get gifts! They will probably see you and your spouse exchanging gifts and want one too. You can easily make your children feel special without breaking the bank. A little bag filled with candy and a small gift is enough to let them know you care. Do you have a fun Valentines Tradition? 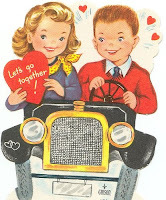 Please share what you do to make your children feel special at Valentine’s day by leaving us a comment! I think it's great to give little inexpensive gifts to your children on Valentine's while you and your husband exchange yours. I like the breakfast idea too. Valentine's is a good teaching day, to teach your children through example how much everyone loves each other in your family. Great tips! I also like the breakfast idea.